This guide will tell you how to deal with Winter from the pegin to end. 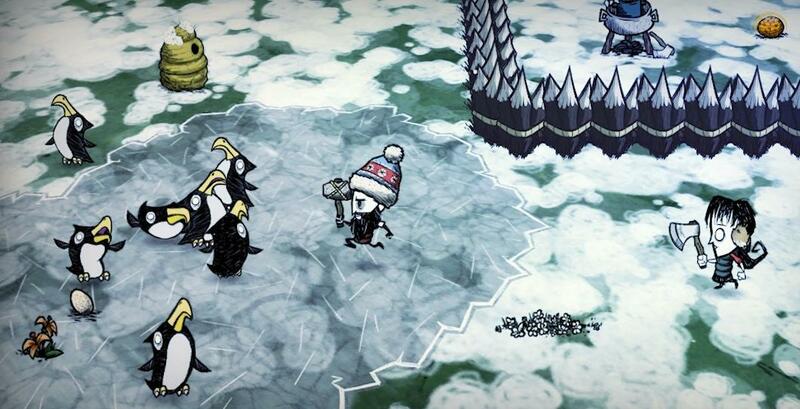 Winter is the second hardest season in Don't Starve. So you need to be prepared to deal with it. Read my Autumn guide to know what resources you need before entering winter for more details. Basically, you need winter gear and food. By this point you should also have an alchemy engine, a shadow manipulator, a crockpot, and an ice box. Also know that you will lose body heat in the winter so you need to make sure you have a good source of heat whether it be fire or something else. This is also why you need Winter gear, because it allows you to lose heat slower. You might feel tempted to just stay at your base for the whole Winter, but you still got things to do. On day one of Winter, heat up and go to the MacTusk camp that you hopefully found in Autumn. The MacTusk only spawns in Winter so you have a limited window of opportunity. Kill the f*cker and get his tusk. If he doesn't drop one wait two days and return to kill him again. Be careful because he has two ice hounds at his comand and he is ranged, making him a hard target to kill. But the reward is very much worth it. With the tooth you can make the walking cane which will make you move much faster when it's held. He also can drop the tam o' shanter which has the best sanity restoration over time in the game but because you constantly want nightmare fuel it's not worth trying to get it. The next item on the list is getting ice. Simply mine ice and get at least 15 to make an ice flingomatic and place it to where the circle encompasses your whole base. The ice flingomatic will douse fires including those started by lightning and heat in the summer. Be careful though, the ice flingomatic will douse fires in the firepit too. Lastly, is food; nothing grows in the Winter except for trees. This makes plant based food hard to come by. Instead your best source of food are koalaphants. Koalaphants turn into winter koalaphants in the Winter. This yields them a winter trunk instead of a normal trunk allowing you to make the best insulator in the game: the puffy vest. Together with the beefalo hat and the thermal stone, you could probably last days without a source of heat. Aditionally, you get 8 meat per koalaphant and you can use ice, monster meat, and whatever you have left over from Autumn as filler, allowing you to make meatballs and meaty stew very easily. There are two new beasts to be aware of in the Winter and one of them returns in every season onwards except Summer. The ice hound will come with hound attacks now and when they die they will do a significant amount of cold damage to all nearby. As a reward though they can drop a blue gem. The other beast you need to be aware of is the first giant you will encounter: the deerclops. He is increadably easy to fight using kiting so he should be no real problem. Just be sure to lead him away from your base as he will destroy everything. he drops a deerclops eye which can be used for the eyebrella, which helps greatly in the Spring and Summer, or, if you already have the ancient guardian's horn, the houndius shootius, which is a turret. Spring has uncontrolable rains and thus you can easily get wet or struck by lightning. Wetness does a number of bad things which I will describe in the Spring guide. The best hat is the eyebrella. But if you don't have the deerclops eye or there is more than one person in the party then you should settle on a rain hat, rain coat, or a umbrella. Make those for your party as well as sewing kits. It's best to keep repairing the eyebrella then just making new ones. Also, make a lightning rod so lightning doesn't strike your base and burn everything. Other than that you have survived Winter and ready for Spring.